The kami who, as grandchild of Amaterasu ōmikami, descended from the Plain of High Heaven (Takamanohara) to the peak of Takachiho in Hyūga of Tsukushi (present-day Kyushu) to rule over the "Central Land of Reed Plains" (Ashihara no Nakatsukuni). Offspring of Amenooshihomimi and Takagi no kami's daughter Yorozuhatahime. According to Kojiki and Nihongi, Ninigi's father Oshihomimi was first commanded to descend and rule the Central Land of Reed Plains, but Ninigi was born while the Central Land was being pacified in preparation for Oshihomimi's descent. The main text of Nihongi states that Ninigi's grandfather Takamimusuhi raised him with particular affection. Furnished by Amaterasu and Takamimusuhi with five retainer kami, as well as with the symbolic sword, mirror and jewel, Ninigi descended in place of his father Oshihomimi. He married the daughter of the "earthly kami" (kunitsukami) named Ōyamatsumi, and later fathered the first emperor Jinmu as well as the ancestors of the Owari and Hayato clans. According to the main text of Nihongi, Ninigi was buried in the mausoleum of Hyūga-no-e in Tsukushi (Kyushu). According to Kojiki, the five kami who accompanied Ninigi at the time of his descent included Amenokoyane and Futodama (both of whom performed divination at the time of Amaterasu's hiding away in the rock cave of heaven); Amenouzume (who underwent possession and lured Amaterasu from the cave); Ishikoridome (ancestral kami of the mirror-making clans); and Tamanooya no mikoto (ancestral kami of the jewel-making clans). The same kami names are listed as retainers in an "alternate writing" recorded by Nihongi. Other kami accompanying Ninigi included Omoikane, Tajikarao, and Amenoiwatowake, while Amenooshihi and Amatsukume no mikoto (ancestor of the Kume no Atai clan) went before Ninigi carrying bows, arrows, swords, and other weapons. Sendai kuji hongi claims that thirty-two kami accompanied Ninigi. The daughter of Ōyamatsumi (according to the main text of Nihongi, the offspring of Ōyamatsumi and a heavenly kami). Married to Ninigi, Konohana Sakuyahime became pregnant in a single night, and gave birth to three children in the midst of fire. The name Konohana ("tree-flower") refers to the short-lived beauty of the cherry blossom, and was given in contrast to Konohana's older sister Iwanagahime, who was ugly but long-lived. Konohana's other names are all associated with the names of the place where she met Ninigi. According to both Kojiki and Nihongi, Ninigi met the beautiful maiden Sakuyahime at Cape Kasasa and immediately asked for her hand in marriage, and the woman's father Ōyamatsumi happily agreed to the match. Following the marriage, Sakuyahime became pregnant in a single night, and asked Ninigi to make special preparations, since she would be giving birth not to an ordinary individual, but to a child of the heavenly kami (amatsukami). 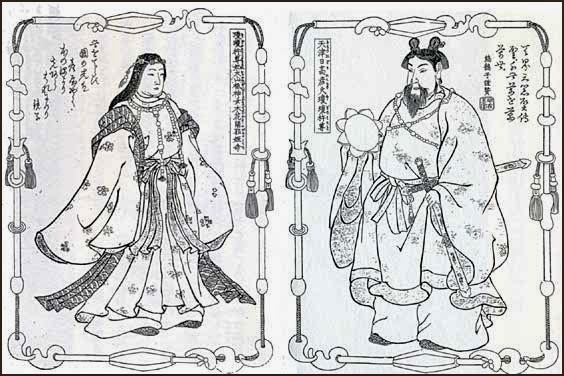 Ninigi, however, was surprised at her claim to have become pregnant in a single night, and suspected that the child was actually the offspring of an earthly kami (kunitsukami). Shamed and enraged at Ninigi's accusation, Sakuyahime entered a doorless parturition hut, setting fire to it with the vow that the child should not be injured if it were truly the offspring of the heavenly kami Ninigi. Inside the hut, Sakuyahime gave birth to three kami, including Hoderi, Hosuseri, and Hoori (according to Kojiki; the names differ somewhat in the various other accounts). Also, an "alternate writing" recorded in Nihongi adds that Sakuyahime was not injured in the fire, that the bamboo knife she used to cut the umbilicals of her babies later grew into a bamboo grove, and that rice from a paddy selected by divination was used to prepare firstfruit offerings at harvest. Another account claims that after Sakuyahime safely gave birth, Ninigi admitted that he had believed her from the beginning, but deliberately angered her in order to demonstrate to the people that the children were indeed offspring of a heavenly kami. Konohana Sakuyahime is one of the enshrined deities (saijin) at Fuji's Asama Jinja. At the shrine at the top Sarutahiko is worshipped, at the shrine at the bottom of the mountain the deity 此花咲爺姫 / コノハナノサクヤビメ Konohana no Sakuyabime is worshipped. She is seen as a deity to get pregnant and provide easy childbirth. When women from 藤崎 Tozaki village come here to pray, they will give birth to a boy. A daughter of Ōyamatsumi. Ōyamatsumi offered both his beautiful daughter Konohana Sakuyahime and her older sister Iwanagahime in marriage to Ninigi. Ninigi, however, could not bear Iwanagahime's unattractive appearance and returned her to her father. According to Kojiki, Ōyamatsumi told Ninigi that he had offered his daughters together with the vow that the life of the emperors would be as eternal as the rocks. But since the elder sister Iwanagahime (lit., "rock-long-princess") was returned, the life of the emperors would henceforth be brief like the blossoms of flowering trees (Konohana Sakuyahime means "tree-flower-blooms-princess"). According to an "alternate writing" transmitted by Nihongi, Iwanagahime was herself embarrassed by the incident and pronounced a curse to the effect that the emperors and all other beings would live lives as evanescent as the tree blossoms. In any event, the two sisters are portrayed as contrasts, and the story is offered as an explanation for the brevity of human life. In later years, however, Iwanagahime came to be revered as a tutelary of longevity. In a different "alternate writing" of Nihongi, Ninigi is portrayed as finding both sisters weaving on a loom in a high palace on the crest of the ocean waves.
. Aoshima Jinja 青島神社　Aoshima Shrine - Miyazaki . Ninigi, a god of Japanese myth, fell in love at first sight with Konohanasakuyahime.
. yabukooji 藪柑子 (やぶこうじ) spearflower, Ardisia japonica .